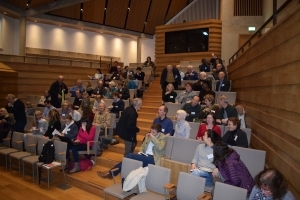 On Friday 12th January Mokoro held a seminar at Wolfson College to celebrate its 35 years of working in the development sector. The seminar looked at the future of development and the growing importance of the private sector. Mokoro were very pleased to welcome Peter Davis, Simon Warmerdam and Steve Collins as speakers. Peter is an independent expert on the role of the private sector in fragile and conflict affected states, Simon was formerly director of the Netherlands Partners for Water programme, and Steve Collins is Director of Valid International and Valid Nutrition. The aim of the seminar was to take a forward-looking perspective on the development sector and how it will change. It is clear that the way Mokoro has been working in the last 35 years will not be the way that Mokoro will work in the next 35 years and beyond. Stephen Turner, Principal Consultant and Director at Mokoro, opened the event with a few reminiscent remarks before the keynote speakers took over. In 1982, Mokoro was established by a group of people who had mainly started their careers in the Ministry of Finance and Development of Botswana. Although Stephen joined Mokoro later, he too spent time in his early career working as a junior civil servant in Botswana. He recalled in those early years tending to think that development was what governments did, but remembered his frustrations at the slow and bureaucratic processes of getting anything done whilst working in the Government of Lesotho and being introduced to the work of dynamic civil society organisations there by a friend and colleague, who was talking about the ways that civil society could bring about genuine change in Lesotho’s development. As he has pondered the role of government and civil society, Stephen has more recently in his career seen the appreciation of the private sector as also being a stakeholder in development and the growing acceptance of the more constructive and engaged approaches that the private sector can play in promoting equitable and sustainable development around the world. With Mokoro, Stephen has done various assignments for the United Nations World Food Programme, who are engaging with private sector food producers in various countries to achieve results in nutritional initiatives. So for Stephen, and many of Mokoro’s consultants, this seminar acted as an important learning and sharing opportunity on what role the private sector plays in a changing development agenda. Peter Davis opened the presentations and was keen to reinforce the view that companies should not be seen as inherently good or bad. The private sector is often given bad publicity because of misbehaviour, but it is important to remember that just because some companies are behaving badly, this doesn’t mean all companies are bad. Companies have size, capabilities, reach and spread that can be beneficial to the development sector and can allow the sector to do things in international development that wouldn’t have been possible otherwise. Peter gave a few examples of private sector initiatives demonstrating this. One was of Heineken in Rwanda. In this case, Heineken were looking at alternative ways of doing things to benefit themselves, but at the same time they were able to help solve key development problems in the country. Rwanda is a country where there are lots of small-scale farmers, making commercial farming very difficult. The country is land-locked which makes transportation and supply chain links very difficult for a private company. Therefore, from Heineken’s perspective, finding a way to develop a local supply chain made sense commercially. Heineken worked with the Dutch government and the Rwandan Ministry of Agriculture to bring enough farmers together to grow sorghum commercially that Heineken could then use for making beer. Heineken faced a further issue in the distribution of the beer. Most of Heineken’s products are sold in kiosks and the small existing distribution companies that could reach these kiosks were found not to have the vehicles needed for the scale of distribution required. Heineken therefore used their financial leverage to enable these small companies to get vans at an achievable cost, which meant Heineken could get its product around the country. Peter went on to stress that the different actors in development (NGOs, governments, donors) all have different strengths and abilities. If they join together, opportunities will be opened and they can solve problems in a holistic way. The challenge, of course, is to get the private sector and donors to work together, and for the donor sector to look beyond seeing the private sector just as ‘profiteers’. There needs to be an understanding of how companies make decisions. Companies are primarily looking at the commercial viability of a project, and also at whether they can make sure that both their people and their equipment are safe. This is where the development sector can support them. Development organisations can help companies tackle issues that they don’t understand, such as those around governance, corruption, security and education. Simon Warmerdam followed Peter, and reinforced the importance of collaboration between stakeholders. He spoke of his experiences from working for the Dutch government, focusing on Dutch aid and trade policy, particularly that of the Dutch water sector and his experiences from Indonesia. Dutch development assistance has been diminishing over time, with decreasing public support and more focus on a limited number of countries and sectors. At the turn of the last century, foreign direct investment through the private sector became larger than even the official development assistance flowing into developing countries. So it has become important for the Dutch to look at how government funding and private sector funding could enhance each other’s roles in the development process in developing countries, and initiatives have been triggered to encourage the private sector and public sector to work together. The Dutch water sector has an excellent international reputation, but its role internationally has historically been quite small. The sector became a focal point of the Dutch diplomatic and Aid and Trade agendas. The Netherlands took the opportunity to organise the second World Water Forum in The Hague in 2000, which forced the whole water sector to work together and also encouraged the Foundation of Netherlands Water Partnerships to be created, supporting the Dutch water sector in export and international cooperation. The private sector, NGOs, government, knowledge institutions and other stakeholders were brought together. Over time, the mind-set of the Dutch water sector has changed. It has become concerned not only to maximise profit and economic growth, but also to ensure that activities are more sustainable and to make choices that support people and the planet while still making a profit. A further change has been to develop a joint effort between the whole Dutch water sector in making sure there is a proper dialogue with developing countries and that there is mutual benefit to all parties. The role of the government was to facilitate the dialogue between parties. They looked at what the local needs were in developing countries and how they could link with the added value of the Dutch water partners. In Indonesia there has been enthusiasm for the Dutch support and there has been a change from a donor relationship to a partner relationship. The Indonesian government was particularly interested in the new technologies that the Dutch could bring into the development process. They jointly set policies to increase the role of the private sector in the water sector and pilot activities were initiated to encourage the input of innovative technologies and methodologies. In parallel the Indonesian government and Dutch companies involved looked together at how they could scale up the pilots and how they could finance large-scale investments. Simon saw that there was an increase in trust in the Dutch parties involved, and also that the Dutch stakeholders, including knowledge institutes and contractors, have begun to work together in a much more coherent way. There have been independent initiatives since then from the private sector and knowledge institutes, with the government now playing a reduced role. The government have therefore managed to facilitate innovation and growth in the water sector so that they can now take place autonomously. Simon expressed a strong belief in building sustainable networks involving the public and private sectors, knowledge institutes and NGOs to facilitate development. Steve Collins, our final speaker spoke on the role social business can play to innovate and deliver market-based solutions to address undernutrition. He focused on the change he has seen on where the moral focus is in aid and development. At the time of Band Aid in the 1980s, the focus was very much around the intention of the giver, with people coming into aid because they wanted to help. Now, Steve argued, we have moved from the focus on intention towards a focus on impact. This change has profound implications for engagement with the private sector. Looking at intention rather than impact has two major negative aspects. The first concerns innovation and the second concerns engagement, particularly engagement with the private sector. The focus on “doing good” has really undermined innovation. Many NGOs develop a “business model” of being seen to address malnutrition. However, as Steve has experienced, addressing malnutrition is a messy business, with the reality being that a lot of people die and a lot of mistakes are made, but NGOs feel unable to talk about their mistakes because they don’t want to damage their reputations . Steve argued that innovation comes from learning from lessons arising from mistakes in the field. However, when NGOs can’t be transparent about their mistakes, innovation can’t take place. Steve gave the example of a publication he produced, against the wishes of an NGO, about a mistake that was made in the field. This publication led to a new model for the treatment of malnutrition. The focus on “doing good” has also undermined engagement because NGOs are keen to maintain the moral high ground and not make profit themselves, whilst companies are promoting an image of corporate social responsibility, giving money to NGOs and creating a ‘do-good’ profile, whilst continuing with bad practice elsewhere. Therefore, the need for both sides to be seen to be doing good has prevented proper engagement between the two. Steve looked at why the considerable resources in the food industry aren’t being used to support the malnourished, when companies want to market themselves as doing good. Poor people are buying food, but no one is providing the fortified food in developing countries that is needed. There is a huge market for this nutritious food and therefore a massive commercial opportunity is being missed to provide people with an affordable, nutritious diet. There is a chance to move from corporate social responsibility to actual partnerships between NGOs and the private sector. Companies bring real capability, in terms of producing fortified foods and in delivering food, and not just cash. The challenge is in getting companies to engage in supplying products for consumers with lower incomes. The private sector is concerned about the lower margins that would be inevitable in this, and they also fear the reputational risk of making profit out of starving people. This is where the role of social businesses comes in, in Steve’s view. Social businesses can work with lower margins, and can act as pioneers and show that it is possible to have products that are affordable for low-income consumers. They need to demonstrate to the public sector whether these products are nutritionally effective, and also demonstrate that there is a commercially viable low-margin business opportunity. A lively discussion followed the presentations, especially on the issue of ‘partnerships’ that came up from all three speakers, with concerns as to how it can be made sure that communities are equal in these partnerships and how to deal with power relations between companies and communities while striving for equality and to ensure communities are properly heard. This was Mokoro’s largest seminar to date and proved to be a fitting celebration as long-time and new friends of Mokoro got together after the seminar. We would like to thank everyone who joined us for this event, especially the speakers and Elizabeth Hodson, who chaired the event. Catherine Dom on Sustainability: what do we think we mean?